A bowl of white cheese. How crazy can this really be? I was skeptical too. Trust me. I didn’t make this recipe up. My cousin Lacy did. See… a restaurants in DC makes this stuff and calls it crazy feta. She was a huge fan. Then they started selling it at Whole Foods for an arm and a leg. And since she really likes her limbs, she checked out the ingredients and decided to try and make it herself. Best decision ever. She first told me about it on one of our walks about a week before we headed to the beach. It sounded good. It didn’t knock my socks off, but I kept it in mind. I don’t love jalapenos, lemon or feta, let alone love it together. Then she talked about it more at the beach. And each time I got a little more intrigued. By Sunday, it was the only thing on my mind. Monday morning I rushed to the grocery store to buy bricked feta, jalapenos and lemons. Because that is exactly where my priorities lie after a week away. Don’t even act like yours lie somewhere else. This is quite possible one of the best things I have ever tasted. 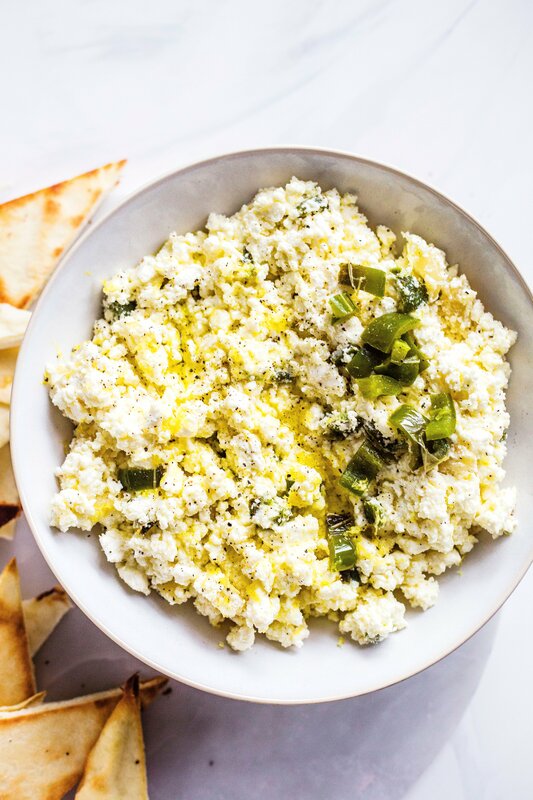 The flavors – tangy feta, spicy jalapenos, bright lemon, caramely garlic – combine to create this delicious explosion of something or other in your mouth. It’s perfect. It has a little bite. It’s madly addicting. It’s fabulous on pita chips. Even better on warm bread. Can you even picture it? 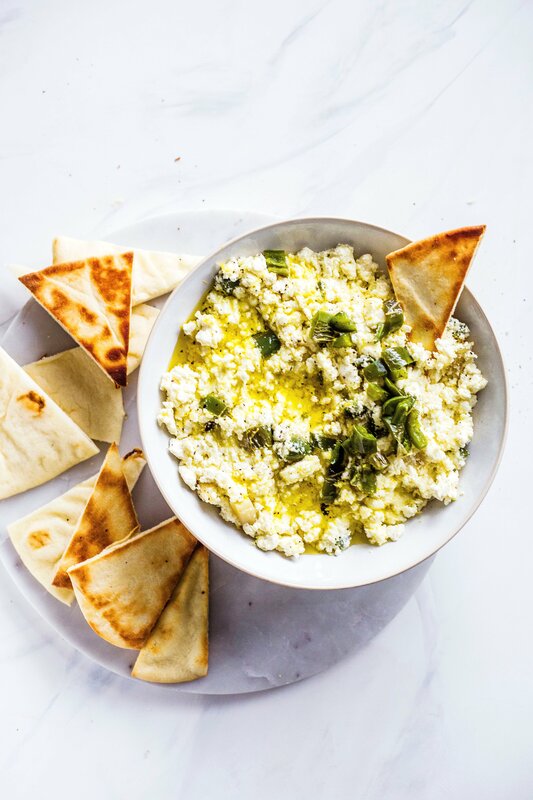 Fluffy, warm pita spread with crazy feta. If that doesn’t sell you, I don’t know what will. You gotta promise me you’ll try this. Pleeeeeeeeease. Preheat oven to 400 degrees. Chop the top off the garlic bulb and drizzle it with a teaspoon of olive oil. Wrap it in foil and roast for 25-30 minutes, or until garlic is golden in color. At the same time, brush the jalapenos with olive oil and sprinkle with salt and pepper. Either grill or roast them – I stuck them in the oven with garlic and just watched until they were charred. Remove both from oven and let cool. Once jalapenos are cooled, remove skins, cut in half and discard the seeds. Chop into small pieces. Don’t touch your eyes! 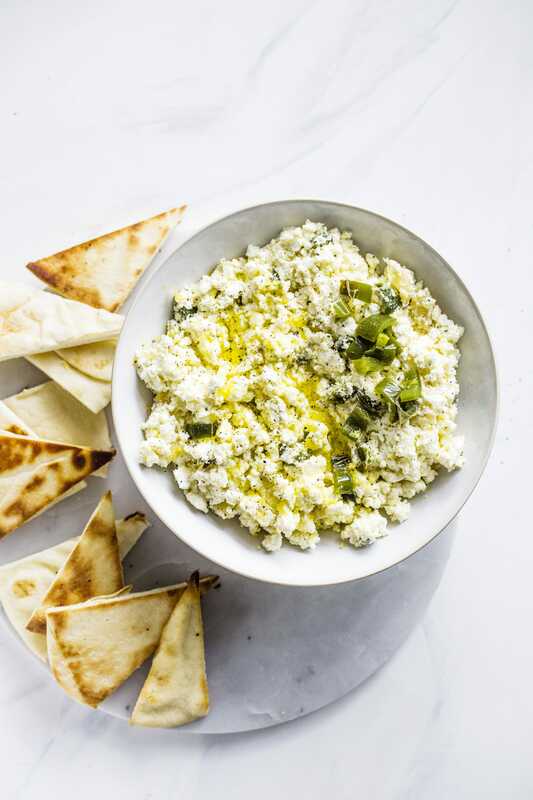 In a large bowl, crumble the feta bricks. [Crumbling the bricks yourself works best, but if you can only find crumbled feta that is fine.] Add chopped jalapenos, the zest of half a lemon, and the juice of half a lemon. Squeeze the roasted garlic out of the bulb directly into the feta. Add 1/4 cup of olive oil and mash with a fork. 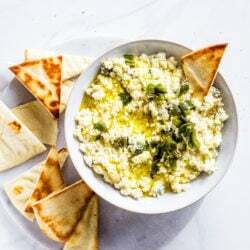 You want the feta to be a bit “wet” – I can best describe it as a cross between a spread and a dip. There is no right or wrong – make it however you’d like. Taste the feta and season with salt and pepper. Serve with pita chips, warm pita or naan, or spread it on sandwiches. Store it in the fridge for up to one week – I find that I like it best at room temperature, so allow it to sit out for about 30 minutes before serving. We also think it would be great with some kalamata olives. This is definitely my new party appetizer. Now you just need to invite me. How many servings does this recipe make? It looks delish! Bless you and your sister for figuring out the recipe. Now to crack their harissa. I am SO excited I found this recipe on your site. I love your blog. I cannot wait to try it out. I am making copycat CAVA bowls for dinner and the only thing missing was the “Crazy Feta”! Thank you!!! OMG! I am so excited! I went to CAVA for the first time today and fell in love with the Crazy Feta…its all I have been able to think about since I left the restaurant! I decided I had to have more and took a chance that I would find someone like me who posted it on line…thank you XOXO will be making this as soon as I get home from the grocery store! Definitely enjoyed this recipe but didn’t taste like the one from CAVA in my opinion. A bit too much lemon for my taste. Does this do well if it is made ahead and frozen?